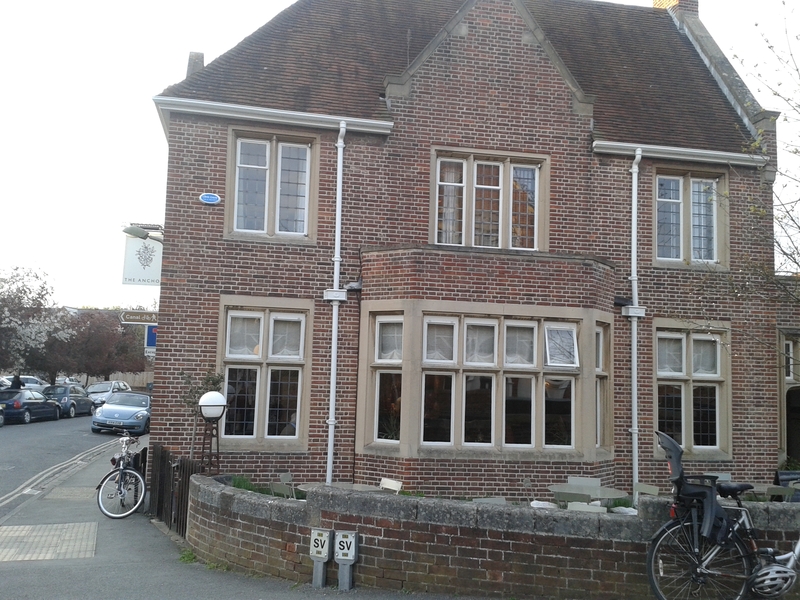 I little while ago I heard by word of mouth that The Anchor, located at the North Oxford end of Jericho, had become an excellent pub with the kind of food I would like so when a French friend and I were looking for a place to eat on a Friday evening, our choice was made. I am glad to report word of mouth was very accurate on that one and thus I would like to spread it further. First the look of the place has changed dramatically since I was there last (a good 8 years ago…) and when the pub was a plain community pub serving ordinary pub grub. Nothing wrong with that but nothing either to justify my coming back. We were offered excellent bread and butter as soon as we sat, like pretty much everywhere on the continent, so the Anchor team managed to win brownie points even before the serious things started by making this inviting habit part of their routine. We then shared rillettes on sourdough bread (£5), which was the only disappointing part of the meal. The rillettes lacked seasoning, they were way too mild and had no consistency. I did wonder if there was pork in them as they looked more like a smooth spread than the thing I have got fat on in France. Still, both Coast and the Old Bookbinders have excellent version of the stuff on their menu so it is possible to find/make them here. Fortunately, after this disappointing nibble, our starters arrived and all was forgotten. My octopus and chorizo salad (£6) was excellent with the octopus being light and fresh, cooked to perfection. The seasoning in the salad was slightly hot but all the flavours were perfectly balanced and complemented each other. I wish I could cook like this as this is a dish I could have every day. My friend’s garlic prawns (£6) were also very tasty though she would have liked a bit more garlic in the sauce. We then had the rib eye steak and fries with café de Paris butter (£14 for 6 oz). I am always anxious to choose steak in English restaurants because I have been so disappointed in the past so unless I know for sure the chef is French, I tend not to. I don’t know if the chef is French there but this steak is the best I have had in England and certainly better than many I’ve had in France. The butter, which seems to have been made with a reduction of wine and shallots completed it as beautifully as begonia flowers complement the Cotswolds stone. It was also really cooked rare as I ordered. Absolute perfection. Since we didn’t have a dessert I’ll have to go back of course. The place looks pleasant if a little noisy and the Polish waitress we had was knowledgeable and efficient and we chatted in the end about our respective accents. All this contributed to make it a very good evening in a pleasant setting with very good but unpretentious food. I can’t wait to go back as in my heart (stomach…?) the Anchor has converted into the Encore. J’adore l’écriture et l’humour de ce blog! You must try it, it is a very very good place. As for rillettes, I have no idea why they seem to be seen as a gastro pub thing over here when really, it would be a bit like selling a ploughman’s lunch as the epitome of British cuisine! Do let me know if you had a good experience too.